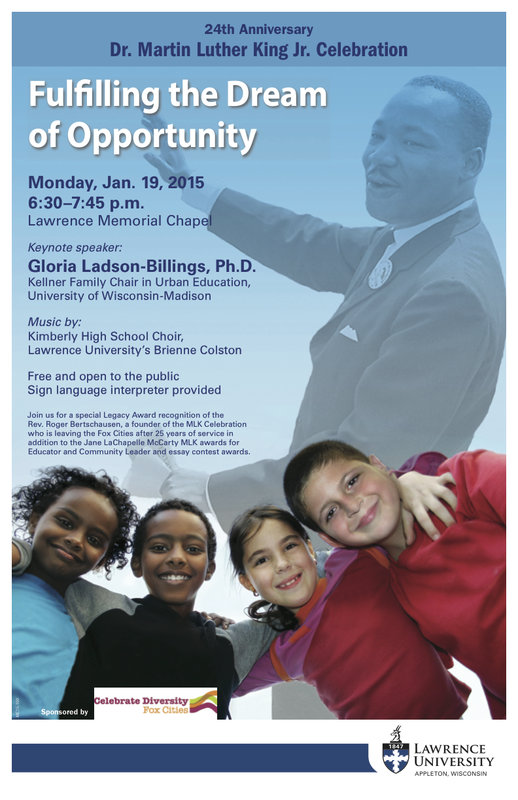 Posted on Jan 2, 2015 by Appleton Downtown Inc.
Join us for a special Legacy Award recognition of the Rev. Roger Bertschausen, a founder of the MLK Celebration who is leaving the Fox Cities after 25 years of service in addition to the Jane LaChapelle McCarty MLK awards for Educator and Community Leader and essay contest awards. Brought to you by: Celebrate Diversity Fox Cities, Lawrence University and several area sponsors who will be listed in the program.